This vase was made by the potter Miyagawa (Makuzu) Kōzan (1842-1916). Although Kōzan also produced ceramic works using earthenware and stoneware, this vase is an example of his works in porcelain, for which he is most famous. New underglaze colours, such as pink and green, that could withstand a high firing temperature, were developed around the time that this vase was made. 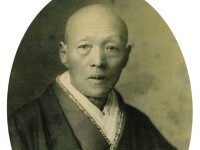 Kōzan was one of the first to exploit the full range of these new possibilities for decoration. Purchased with the assistance of the Story Fund, 1991. 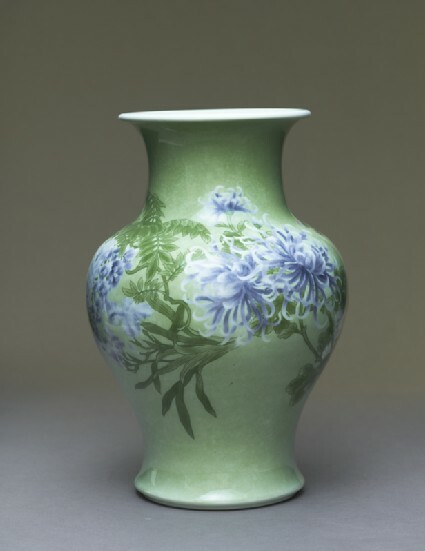 Baluster-shaped porcelain vase decorated in underglaze green, white and mauve with raised white enamel, showing clumps of flowers on a mottled green ground. Signed on base in underglaze blue: Makuzu Kōzan sei. New underglaze colours, such as pink and green, colours that would stand a high temperature firing, were developed around this time, partly through the assistance of Gottfried Wagener, a scientific polymath, who was an oyatoi gaijin, a foreigner employed by the Japanese government to develop Japanese industry and art industry. Kōzan was one of the first to seek his advice, and to exploit the full range of these colours (as was Namikawa Yasuyuki for enamels [see EA1988.1, EA1993.39, EA1995.151, EA2000.48, EA2000.180, EA2002.177]).